The conference, hosted by the Roy G. Perry College of Engineering, takes place annually and its purpose is to aid businesses in their efforts to diversify the workforce for the 21st century and beyond. Engineering professionals, military personnel and leaders from top corporations were brought together to develop strategies that will encourage the engineering profession among minority students. Conference speakers were Lloyd W. Howell, Jr., executive vice president, Booz Allen Hamilton Inc., 2011 Black Engineer of the Year and the Council of Engineering Deans. Howell encouraged participants to keep championing the cause, so that other students may be impacted and encouraged to pursue engineering said. 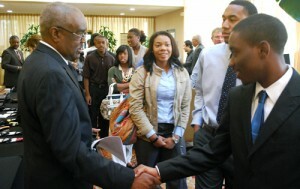 Advancing Minorities’ Interest in Engineering Conference at PVAMU.